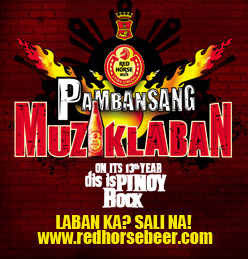 Join the Red Horse Muziklaban 2012! Please submit the following requirements in (1) brown envelope to our office, 2204D West Tower PSEC Tektike Bldg., Exchange Road Ortigas Pasig City. 1. Download the entry form at www.redhorsebeer.com. (1) original song, (1) Red Horse Beer Composition, (1) cover song from any foreign or local artists. Total recording time should not exceed 15 mins. All casete tapes or CD's must be labeled with the band's name, unique code and title of each song. 5. Ten (10) crowns of red horse beer 2012 500ml per band member. Seal and indicate on envelope the name of band. Read the full mechanics here. CONTACT LEA CHUA thru +63.915.6183544 or MS. GELLET thru +63.906.4559821 or +63.908.7051817 for more info.